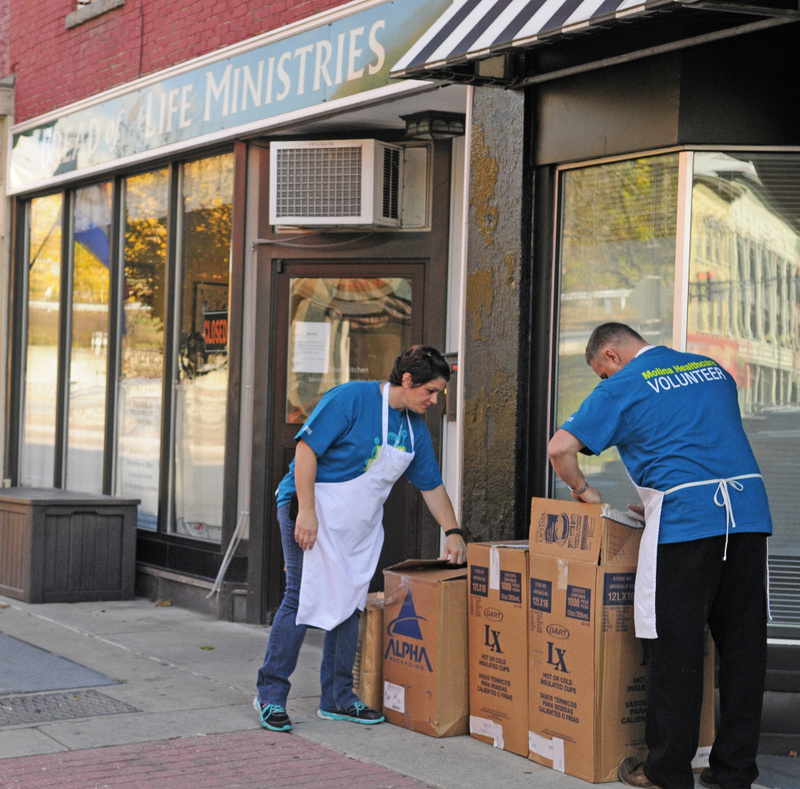 Volunteers from outside groups serve at the Bread of Life Soup Kitchen on Water Street on occasion, giving regular volunteers a day off and letting others see a side of the community that is most often invisible. AUGUSTA — The last time Linda Osgood was at the Bread of Life soup kitchen on Water Street, temperatures were stuck in the single digits as she and her fellow Molina Healthcare employees handed out hats, mittens and socks. Osgood recalls hugs and thanks from those who received the clothes, which included an impromptu donation of a coat worn by one of Osgood’s co-workers to a man wearing only a shirt. “We left with a warm sense of community,” Osgood said. Osgood, along with nearly a dozen other Molina employees, returned to the soup kitchen Friday to help serve meals and to hand out 125 bags loaded with hats, gloves and wool socks. Molina, a national healthcare provider with an office off Civic Center Drive, regularly donates time and money to their communities for various causes, said Tina Dubois, who, like all the other volunteers at the soup kitchen Friday, is a manager at Molina. Molina employees first volunteered at the soup kitchen last year. Several, including Osgood, decided to return Friday because of their experience during the first visit. “It gave me the opportunity to see the great work this mission does,” said Molina manager Terrence Southward. Molina Manager Norman Curtis, who volunteered at the kitchen last year, said the company offers paid time off for its employees to volunteer in the community. Curtis said employees have organized food drives in addition to helping out at the food kitchen and handing out warm clothes. Curtis said he was eager to return to the kitchen this year. 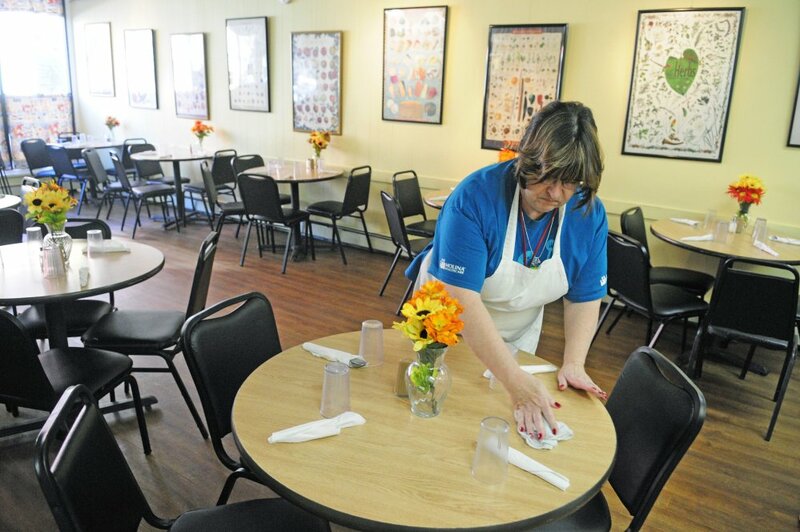 Curtis said he admires the regular staff and volunteers who typically serve up the meals. The kitchen feeds lunch to between 80 and 180 people per day, Monday through Friday. Patsy Tessier, kitchen manager for the soup kitchen, said groups come in a few times a year to volunteer to prepare and serve a meal. The groups allow most of the regular volunteers to take a day off, and the group members get to see a side of the community that is most often invisible. “It gives them a perspective they didn’t have before,” Tessier said. Osgood said she still carries the lessons she learned volunteering last year at the kitchen. Tessier said only a fraction of those who come to the soup kitchen are homeless. There are people from all walks of life, many craving companionship as much as food. “For a lot of people, it’s important for socializing as well as the meal,” Tessier said. Osgood said last year’s experience stirred the employees to do more fundraising to buy more food. Richardson said such responses are common among first-time volunteers at the kitchen. The volunteers usually arrive at the kitchen believing they will bless those they help feed, but most often the bigger benefit belongs to the volunteers. Volunteers who have their first experience with a group will often return to the kitchen to volunteer on their own, sometimes building long-lasting commitments to the program. “These people we serve will teach you something about generosity, and these are the people who have the least,” Richardson said. It perhaps makes sense, then, that some of the clients who make use of Bread of Life’s services, which also include homeless shelters, volunteer their time at the kitchen. To volunteer at the soup kitchen, call Patsy Tessier at 621-2541.